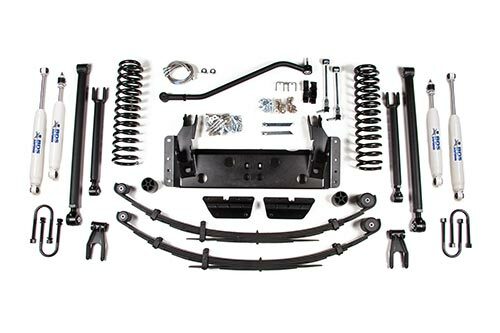 This kit comes with front and rear Pro-Ride coils springs and matching BDS NX2 series shock absorbers. These coils are made from 5160 spring steel and pre-set to handle anything that you can throw at them. The kit includes adjustable upper control arms with flex ends. The lower control arms are adjustable and are made from 1-3/4" OD 1/4" wall DOM tubing. BDS' ultimate sway bar disconnects are included to allow for some serious off road flex. New Kevlar lined stainless steel brake lines are included. No welding to the uni-body is required nor is it recommended. A new heavy duty belly pan is included to gain ground clearance as well as offer serious protection. The rear is lifted with new BDS Glide-Ride 3" leaf springs with greasable 1" extended shackles that allow the springs to really flex. Slip yoke eliminator and rear CV style driveshaft is required for installation. This system only works on 4.0 liter and automatic transmission models. The Jeep Cherokee was produced with two different rear axles (Chrysler 8.25 or Dana 35). You will need to measure your rear u-bolts to ensure that you get the correct new u-bolts. Installation of this system will require a slip yoke eliminator and CV style rear driveshaft that does not come in the kit. The long arm upgrade option will only work with applications from 1987-2001 equipped with the 4.0L motor and automatic transmission. 1996 and earlier models may require a longer emergency brake cable.